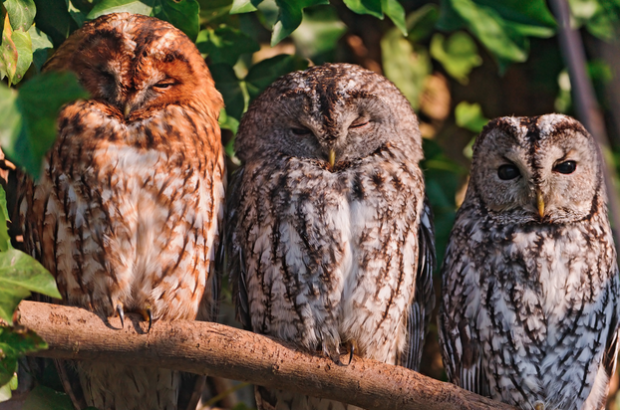 Three isn’t a crowd when it comes to your social media’s content strategy. Plus, if you’re an owl it’s called a Parliament. Why is sharing outsider content by other businesses or thought leaders so important? It shows your audience that you know the industry like the back of your hand, you’re collegial and aware of competition. It shows that you’re collaborative and confident enough in your own brand to share another’s content. It also doubles your exposure by connecting your content to their audience or online community. By sharing content from another business, even a competitor, you position your business as the industry’s finest, most well rounded content source. Find Industry Influencers: Use keyword searches or Twitter’s suggested user lists to find influencers in your industry. Once you’ve found them, add them to a list or stream for continued listening. Follow your Competition: Find your competition or other related businesses online with keyword searches, add them to a list or stream and start sharing the good stuff. Follow Industry Hashtags and Keywords: Source your industry’s hashtags or keywords and follow them in a stream to keep them in your backpocket. This will help you find new content and know what to include in yours. Make Lists: Create lists of influencers, competitors, industry keywords and thought leaders and keep them in separate streams for easy listening. Set up Streams: Multiple streams simplify your listening opportunities so you can spend less time searching for great content. Use Multiple Re-Tweet Styles: In HootSuite, by selecting “edit” in the Retweet button, you can give their content your own spin. Or, by selecting “Yes,” it simply goes out over your channels with their profile attached. This makes your Twitter feed look more dynamic and shows that you’re outsourcing content (good thing). 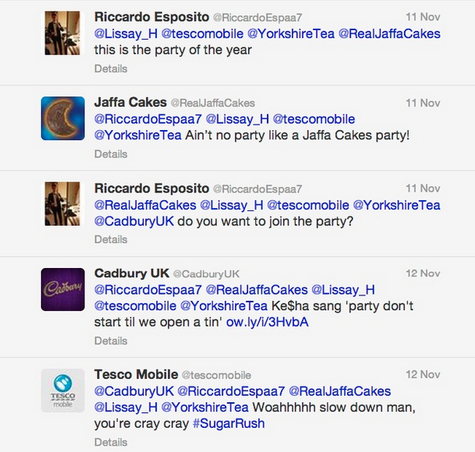 One great example of brands collaborating together to increase their exposure is with @TescoMobile, @YorkshireTea, @RealJaffaCakes, @CadburyUK… the list goes on. Tapping into a customer conversation with Tesco Mobile, each of these businesses exploded in growth thanks to their more fun, collaborative sides. Getting personal on social media is twofold: build your personal brand on your own channels and be more personable on your business’s. Personal accounts give you the opportunity to share engaging content, build a personal brand around your interests and engage with your followers. Businesses, on the other hand, can learn a lot from personal social accounts. Engaging with your audience over personal interactions opens your business up and shows a vulnerable, more human side. This could mean sharing your customers’ stories, liking their comments or encouraging employees to be brand ambassadors online. In doing so, you’re not only acknowledging your audience, but building an engaged community. Rely on Teams: Empower your employees to be ambassadors online. They can share and amplify your business’ content, jump into one-on-one conversations with a personal touch, and collaborate to reply to and like fans’ comments. Set up Streams: Use streams and tabs for a quick overview of your social media activity. This helps to listen and engage better with your audience. Find Community Ambassadors: Let’s say you wrote a blog post about your business and a fan had a lot to say in the comments. Reach out to them to write guest posts or follow them on social media to source different perspectives. At HootSuite we empower employees to be ambassadors with a personal touch. For example, everyone is encouraged to contribute to the blog and build a professional, personal brand. This adds fresh perspectives and exposes HootSuite to more diverse audiences. Likewise, our customer service team is encouraged to sign messages with their name (^SM for example). This allows them to have a voice and drive personal interactions while being helpful.